US, 1991, 75 minutes, Colour. Voices of: James Stewart, Erica Yohn, Cathy Cavadini, Nehemiah Persoff, Dom De Luise, Amy Irving, John Cleese, Jon Lovitz. Directed by Philip Nibbelink and Simon Wells. An American Tail was very popular during the 1980s, the story of mice migrating from Europe, paralleling the Jews persecuted by the pogroms and Cossacks, to New York City. In bright colour, with lively characters, the film and its entertainment was a reflection on immigrants. This film is similar insofar as starts in New York City, the population of the Jewish mice and their struggle for survival, the picture of the family, especially with the young son, featured in the first film, Fievel. Fievel is a lively mouse, friendly with a cat, Tiger, voiced by Dom de Luise. He is in love with Miss Kitty, voiced by Amy Irving. There is a villain, Cat R. Waul, voiced by John Cleese, who is campaigning to entice all the mice in New York to migrate West where he would employ them in building up his own empire and then, with his cat thugs Folks, devour them as mouse burgers. The families go West, but fievel finds himself off the train, trudging through the desert, encountering Tiger, who has tried to go West, being roasted by a group of Indians who think he is a God. Eventually, Fievel arrives in the town, tries to expose the cats, while their leader is infatuated by music and voices and has employed Fievel’s sister, Tania, to sing in the saloon to the delight of the gambling cats. 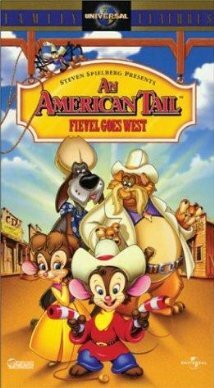 Fievel tries to employe the sheriff, Wyatt Burp, voiced by James Stewart, to help him overcome the cats – which he does. The film relies on audience response to the treks to the west, the dangers in the western towns, law and order – but all in the form of cats and mice. There is a pleasant brother by James Horner – which audiences may find familiar, and then think of the theme from Titanic, six years later. 1. The popularity of An American Tail? Popular sequel? 2. The US, the 19th century, the traditions, Go West? Hopes, pioneers, exploiters? The Jewish theme? 3. The range of the voice cast? 4. The animation, bright, colourful, the characters, New York City, the train, the western town, and some? Humour? The musical score – and the range of songs, especially Tania’s ballad? 5. Fievel, his appearance? Family, his parents, his sister, all mice, Tiger as his friend? The migrant family? 6. Feivel and his imagination of the wild west? Wyatt Burp, James Stewart’s voice, the scenario, action, shootout, hero, waking up? 7. Cat R. Waul, John Cleese’s voice, British but pretending to be American? Henchman cats, the puppet, his appeal to the mice and his lies, his plan, the eagerness of the mice given tickets for the train, on the train, the meeting with Feivel? 8. Tiger and Miss Kitty? The touch of romance? Going West, Tiger and his compliments? The tangles, the farewell to Fievel? 9. Fievel’s adventures, on and off the train, in the carriage with the villains, on the link between carriages, falling off? In the desert, the coach? 10. Tiger and his adventures, trying to get on the train, missing it, going West, coach, found by the Indians, roasting him, thinking he was a God, his leaving with Fievel? 11. The family, in the West, the hard work of the mice, building, the cats supervising? Their hopes for mouseburgers? 12. The saloon, Miss Kitty, the need for music, Cat R.Waul and his love of singing, Tania, her hopes, the violin, the singing, and going to the saloon, and nervousness, singing and charming cats, the parents, success? 13. Fievel, his appeal to Sheriff Burp, tired, to action, the confrontation with cats, Fievel’s father playing the violin and its screechy effect? 14. The victory over the cats, hope for the mice and the West?